The idea of being able to send or receive cell phone text messages on a computer is not a new one, but this Chinese software called “Fetion” (飞信 in Chinese, literally, “flying letter”) is new to me. In a recent AllSet Learning teacher training session, we were discussing various types of technology for learning, including ChinesePod, Anki, and Skritter, when 飞信 came up (weird English name: “Fetion”). For now, Fetion is PC only, although it also has mobile versions. Its “smartphone” version is aimed at Windows Mobile users, not Android or iPhone users. This all makes a lot of sense if Fetion is targeting a younger Chinese demographic rather than professionals. I’ve got to say, this doesn’t seem especially impressive; this technology has been around for a while. It seems that Fetion has caught on with a sizable userbase, however. I’m curious how far it will go. Have you used Fetion? What are your experiences with it? Is it useful? Do any of your Chinese friends use 飞信? I’ve written before about SRS. I stated that I had my “misgivings” (a post still unwritten), but that I think it’s a good technology which will eventually become more pervasive. In the meantime it’s very DIY. It’s hard for most of us to like, and it’s easy to get it wrong. Yes, it’s easy to get wrong. Khatzumoto frequently tells us about some of the mistakes he’s made and how to avoid them, and John Biesnecker has some tips as well. I’d like to share one of mine. The mistake I made was big enough to destroy my enthusiasm for SRS and Anki (a great program). In fact, I’ve come to the conclusion that the only way forward, short of abandoning SRS as method, is a total Anki reset. Deleting all your SRS data is something you don’t ordinarily want to do (it builds on itself and evolves over time), but in my case I have no choice. Yeah, this is kind of a newbie mistake, but I wanted to learn lots of obscure country names, so I just entered them all in. Only problem is I never talk or write about those countries in Chinese. I don’t even like politics or geography. I was entering data into Anki, which was dutifully passing it on into a “memory black hole.” And then I kept having to review those names over and over again, and then forgetting them. Lesson learned: Don’t enter language you’re pretty sure you’ll never need. Around the time I was getting more enthusiastic about Anki, I was also reading a lot more Chinese literature as part of an effort to sophisticate my Chinese. So I added a bunch of semi-archaic vocabulary from Lu Xun stories. Mistake! The problem was that these were words I would basically only see in writing, and many of them were fairly easy to figure out in context. Driven to totally master that vocabulary, I was trying to force into my active vocabulary quite a few items which really had no business being there. They would have been perfectly fine just chilling in my passive vocabulary, and simply continuing to read more would reinforce them enough. So after learning my lessons, I’ve wiped my Anki data clean. Now the data I enter is vocabulary I can imagine myself actually using. This does wonders for my motivation to use Anki, becomes reinforcing these fun and useful terms puts me that much closer to better speaking ability. Rather than (potentially) improving my reading speed, I’m working on enhancing my human interactions. That is way more motivating. 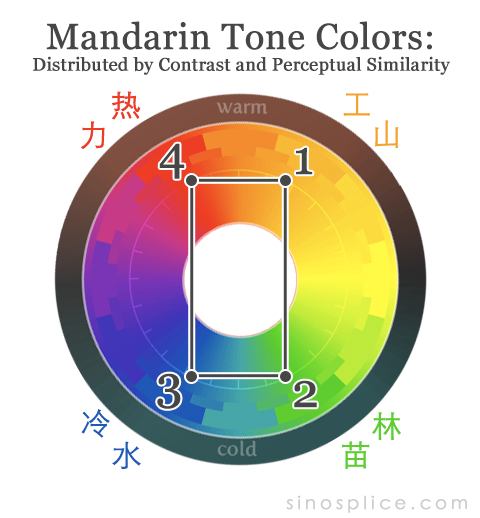 > I hope that my system gives a context, even for non-visual learners, for distinguishing between the four tones in Mandarin and providing a mnemonic system to help them remember which tone goes with a particular word. From the moment I first heard of this idea, I was intrigued by it. Associating tones with colors does open up a lot of possibilities. Once the system is internalized, you can drop tone marks and tone numbers altogether, and you can tone-code the Chinese characters themselves using color. (The best non-color approximation to this would be writing the tone marks above the characters, which you will find in some textbooks and programs.) So I was very receptive to this idea. Why would these colors feel wrong to me? 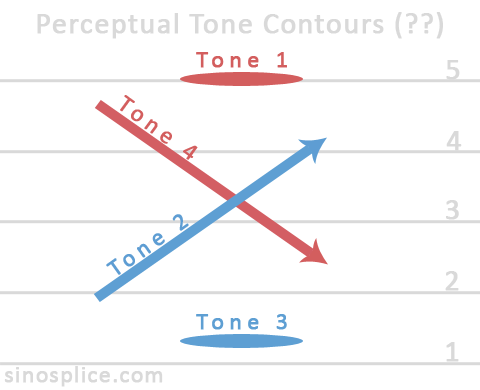 How could the tone-color associations be anything but arbitrary? Specifically, I felt that first and fourth tone feel similar, and that second and third tone feel similar. I believe that perceived similarity is strong enough that it affects both listening comprehension and production. This is why I purposely colored first and fourth tone red in my diagram, and second and third tone blue. OK, so now we’re getting down to the point of my post. As a thought exercise I asked myself: If I had to assign colors to the four tones, which colors would I use? 1. The colors need to have a high degree of contrast so that they will stand out on a white background and not be confused with each other. 2. The colors chosen need to reflect the appropriate perceptual similarities. > If a person was going to design a color code tone system they would probably want to avoid using red and green in the same color scheme. Red – green color blindness causes an inability to discriminate differences in red and green. Hence the testing when you get your driver’s license. 5 to 8 percent of males have this color blindness. > Using red and orange in the same scheme is also not very bright. Much language learning is done on buses, trains, planes and their attendant stations. Lighting is sub-optimal in all these situations and much worse in China. Low light intensity impairs the ability to discriminate red from orange. These points have some merit, I suppose, but I’m not sure what colors they leave. I’m sticking to the two principles I listed above. I don’t see how you’re going to avoid either red or orange altogether if you need easily distinguishable, high-contrast colors. Regarding the principle of high contrast, I can’t disagree with Dummitt’s choices. You can’t choose yellow, and the ones he chose are easy to distinguish quickly. As for perceptual similarities, I would reflect these similarities by grouping the four tones into two warm and two cool colors. In my Chinese studies over the years, I have often associated fourth tone with aggression or anger, both concepts which I would associate with the color red. Red = fourth tone is the strongest association I have, but from there, all the others fall into place. You can’t use yellow (poor contrast), so orange is your other warm color, going to first tone. My diagram has fourth tone and second tone diametrically opposed (falling versus rising), and green is directly opposite red on the color wheel, so I would go with green for second tone. That makes third tone blue. So you’re at a party. It’s not some crazy kegger, it’s just one of those social mixers you go to every once in a while to meet people. A homely guy walks up to you and introduces himself as Craig. He’s a financial consultant. He soon moves on. “Uhhh, Craig, right?” you reply. “Uhhhh,” you say intelligently as you draw a blank. “Financial consultant!” he says snippily and walks off. A few minutes later he’s back again. He walks up to you and looks at you. “Hey, Craig the financial consultant,” you say. He nods and moves on. He shows up again an hour later, and then one more time before the end of the event. He’s satisfied you know who he is. The scene described above is a fictional dramatization of how spaced repetition works. Just like you forgot unmemorable Craig’s profession only 5 minutes after meeting him, you forget most things you learn. That is, unless you’re reminded. And it turns out that there are optimal times to be reminded, and that the more you’re reminded, the less often you need to be reminded. This is the “spacing” of “spaced repetition,” and its rules been pretty well figured out. The famous Pimsleur language learning system is based on the principle of spaced repetition. It was designed for a time when static audio recordings were cutting edge, however, and the latest adaptation of the spaced repetition principle is spaced repetition software (SRS), which has been refined quite nicely in recent years by a Polish man named Piotr Wozniak. With SRS, you “join the party” by starting up the software. You’re presented with various “cards” or “facts” which you want to remember. Some of them, like Craig, aren’t particularly memorable, and when they come up again, you may falter. No matter; SRS is infinitely patient. The more you have trouble with a fact, the more often it shows up in your review cycles, until eventually you get it down pat and it gets spaced out to the point where you hardly ever see it again. Personally, while I have my misgivings about SRS (a topic for another post), I think it’s a fantastic concept. The idea that, through science, we can understand how we forget, describe it in algorithms, and then systematically counteract it through software and learned behaviors is nothing short of amazing. The problem is that most of us aren’t willing to simply plug in and “trust the machine.” We prefer to live our lives unplugged… or at least not to be ritually spoon-fed our knowledge. > Based on years of applied research, Cerego has built adaptive, web-based applications that accelerate knowledge acquisition. Cerego’s patented core learning engine is driven by algorithms that generate optimal learning schedules for discrete chunks of declarative learning content, called “items”. This intelligent scheduling is achieved by gathering metadata on individual user performance and modeling memory decay patterns at the granular level of every item. The fact is, the average person doesn’t need to learn to change his habits to adapt SRS. As various companies and developers realize the value that SRS integration offers any kind of learning system, they’re integrating it into their existing products and services. It’s starting to appear in more and more products we already use. In the next few years, you can expect the slower ones to join the party as well. SRS is coming to you.